KANSAS CITY, Mo. — The Kansas City Chiefs’ practice facility near Arrowhead Stadium is named for the University of Kansas Hospital, which is altogether fitting given the state of the team the past few years. Lysol would be another fitting sponsor. That’s because the Chiefs almost certainly doused the building in disinfectant while they were on the road for their regular-season finale, a 27-24 victory over the Denver Broncos. The Chiefs have been dealing with an illness that has ripped through the club, forcing everyone from stars such as Justin Houston and Travis Kelce to role players such as Charcandrick West to miss practice or games. “We’ve tried to quarantine the guys the best we could, get them out of the building,” Chiefs coach Andy Reid said during a conference call Monday. “Quarantine’s not the right word, but we’ve tried to get them away from the team, tried to isolate them the best we can. Reid sounded optimistic that his players felled by illness would be ready for the Chiefs’ playoff game against Tennessee on Saturday, though it’s early enough in the week that anything could happen. Houston and Kelce were sick the week before their game against the Dolphins, though both players were active. West was joined by defensive tackle Rakeem Nunez-Roches, offensive lineman Cam Irving and defensive back Kenneth Acker in the sick bay before the Chiefs’ game against the Broncos. In the case of West, the illness put the Chiefs in quite a predicament. Reid wanted to give most of his starters the game off, since the Chiefs had already clinched the AFC West title and could not improve their playoff positioning. 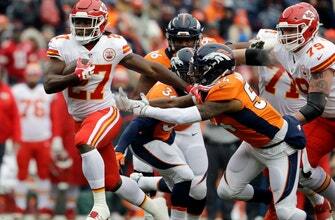 So, after Kareem Hunt took a carry 35 yards for a touchdown to wrap up the NFL rushing title, the Pro Bowl rookie got the rest of the day off. But with West left behind in Kansas City, the Chiefs had only Akeem Hunt available at running back, and he went down with an injury. That forced fullback Anthony Sherman — with six career carries to his name — to tote the ball 14 times for 40 yards and his first career touchdown run. “Sherm hasn’t carried the ball that many times since high school,” Reid said. Still, the Chiefs managed to give most of the starters the afternoon off in Denver, and that should ensure just about everybody with an illness or injury is close to 100 percent by Saturday. And that could be doubly beneficial considering the Titans needed to play their starters in a must-win game Sunday, and now must travel to Arrowhead Stadium on a short week for their playoff game. In other news, Reid said dynamic wide receiver Tyreek Hill would practice when the Chiefs begin their game-week preparations Tuesday. Hill had left the team last week following a death in the family, and while he probably wouldn’t have played Sunday, it was the first game he’d missed in his career. Hill has 75 catches for 1,183 yards and seven touchdowns this season, and the speedster was voted to his second Pro Bowl in as many pro seasons as a return specialist. Reid also said wide receiver De’Anthony Thomas had surgery on his fractured leg in Denver and would remain there for “a day or so,” then likely return to Kansas City. Thomas was hurt while returning a punt in the first quarter and will land on injured reserve this week. There were no other injury updates Monday as players trickled into the building for treatment. Hunt twisted his ankle against the Broncos, while wide receiver Albert Wilson’s hamstring tightened up and Nunez-Roches sprained an ankle. Backup cornerback Phillip Gaines dislocated his elbow. Wilson and Nunez-Roches are regulars, and neither of their injuries is considered serious.